It is common for floors to get wet, pavement to become uneven and slip and falls to happen. 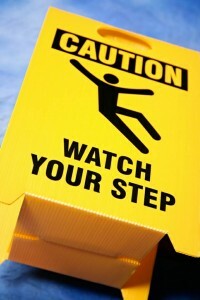 It is for that reason that not every instance of a slip and fall accident should result in a lawsuit. Business and homeowners cannot be expected to catch every item or liquid on the ground immediately. They cannot be held liable for every slip or trip that occurs on the premise. There is a level of responsibility for one’s own actions that need to be taken into account before pursuing a personal injury lawsuit due to a slip and fall accident. A personal injury lawyer will be able to go over the details of your accident with you and confirm whether or not you have grounds to make a claim. When it comes to determining liability for injuries related to a slip and fall accident in Florida, certain things need to be taken into account. Whether or not the owner of the property or an employee caused the spill or knew about the source of danger on the premises and failed to do anything about it for example. These cases revolve around common sense; had the owner taken reasonable measures to provide a safe environment? Where they neglectful of maintaining a safe environment? To win a slip and fall case, you must show how the property owner was liable for the accident. You must also be able to show you suffered a significant injury directly caused by their negligence. This is why consulting a personal injury attorney is so important. Your attorney will be able to go over the details contributing to your fall such as; poor lighting, broken furniture or railings, lack of signage warning people of any potential dangers or barricades preventing entry into a risky area of the property. Whether or not a lack of proper building inspections and regular maintenance had a hand in your accident. All Florida personal injury cases consider whether the accident victim shares any part of the blame. If your own carelessness contributed to the accident, you may be awarded less money. Was there signage a careful person would have noticed? Did you disregard rules or warnings? Were you simply distracted by something else and not paying attention to your surroundings when you were injured? If found to be liable in Florida, premises law liability means that the property owner may be responsible for your accident related expenses such as medical costs, medication expenses, reimbursement for work time lost, emotional distress and household assistance. Personal injury lawyer, Jonah Wolfson has been practicing law for 12 years in Miami Florida. He is a recipient of the Chicago-Kent young Alumni award from his former law school and the founder of Wolfson Law Firm. Jonah has represented Plaintiffs and Defendants alike in many slip and fall cases. Contact Wolfson Law Firm for assistance with your personal injury case. In addition to slip and fall accidents, the firm represents clients in cases involving wrongful death, car accidents, motorcycles, negligent security, medical malpractice, legal malpractice, and other complex tort scenarios.